You might think that any recipe with spinach is going to be a bit ‘worthy’. But you’d be wrong. “Cooking spinach without oil is like cooking grass”, my mum says. And she’s right. Which is why you need at least 4 tablespoons of olive oil for this recipe. This dish will really surprise you. Unctuous, earthy, divine. With the muskiness of the spinach and the tenderness of the chicken, I doubt you’ll look at spinach in quite the same way again. And don’t bother with fresh spinach – it’s too unwieldy to work with in the quantities you will need for this recipe. This should feed 4 people. Put the frozen spinach into a pan with ½ cup water and cook on a medium heat until most of the liquid has gone. Meanwhile, in a separate pan, and on a medium heat, add the oil and then the onion, and cook until browned, about 10 minutes. Optional: add a few chopped cloves of garlic and mix well. Mix through to combine and cook until the oil separates out, 10-15 mins. Add the spinach and the ginger, evaporate virtually all the liquid, mixing, for 10-15 mins. TIP: If spinach isn’t your thing, you can omit the spinach and just put ginger in. Check out the recipe for Ginger Chicken. Sounds fab – but for how many? Good point! 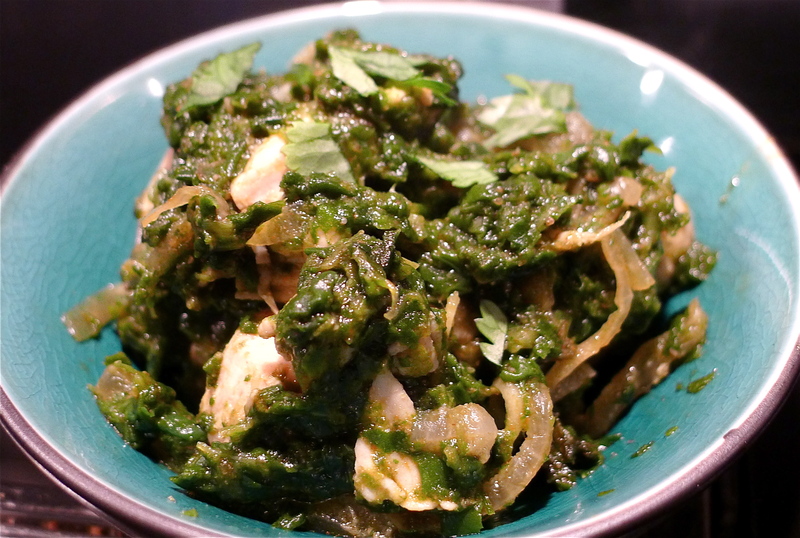 i would say 4 people, or 3 greedy ones..
Chicken Saag now perfected…. 4th or 5th time now and the addition of garlic is wow!!! Part of my regular diet. Gimme more, more, more. A printable version of the recipes would be nice. Where can I get the frozen spinach? Really looking forward to cooking Saag Chicken! I get my frozen chopped spinach in Sainsbury’s – right next to the frozen leaf spinach. Maybe try the bigger stores? Good luck! Thank you so much Aasmahmir – I’m now no longer a 55 y/old Curry Virgin; yup, I’m ashamed to say Saag Chicken was the first curry I’ve cooked. Wife and I really enjoyed it – decided to use lemon as additional flavour, using lemon oil and adding lemon zest which worked well for us (perhaps I should have washed it down with PLJ!). Appreciated the recipe’s (relative) simplicity and speed as well as wholesome flavours and would like to think it was a healthyish meal too! Onwards and upwards to your Fish Curry methinks. Hi Aasmah, got the spinach and have now made the dish twice, it is really delicious, simple to cook and must be good for you too with all that spinach!! Do you think it could be frozen? Hi Gery, all the curries on here are medium to hot. If you want them hot, use 1 tsp hot chilli powder, for medium use half tsp; and for mild, a bit less than that. Hi, I can cook but decided to try “new” recipes and came across your website. Tried the saag chicken. I found the end product a bit bland and wondered how it could be made a bit more spicy (not just hot) without destroying the dish. Also I used chicken breast and as often happens with breast, it was a bit dry tasting – any better cuts of the chicken? Hi Raj, all I can suggest is that you increase the amount of garlic and ginger and coriander powder. If you’re a fan of ghee, maybe use that instead of veg/olive oil. Also my mum uses more oil anyway but I am trying to keep this dish healthy. We were very fussy as kids and didn’t like any boned chicken in our food so our poor mum had to use boneless cuts. But you could use chicken thighs etc as long as you keep the pieces relatively small. Good luck. Hi, I’ve realised that u have to put the spinach in a pan of water until the water has evaporated, why is that? Many recipes I have seen they say to add the spinach directly into the pan. What difference will it make? It’s just the way my mum does it.. but other people have said that they just add the frozen spinach to the pan. Make sure you get rid of all the water though. Good luck. Hi, im English but i love Indian food and have just started to try and cook my own. Today for the first time ever i made a Moong Dal (uttar pradesh-style) with basmati & cumin seed rice and it was really delicious. 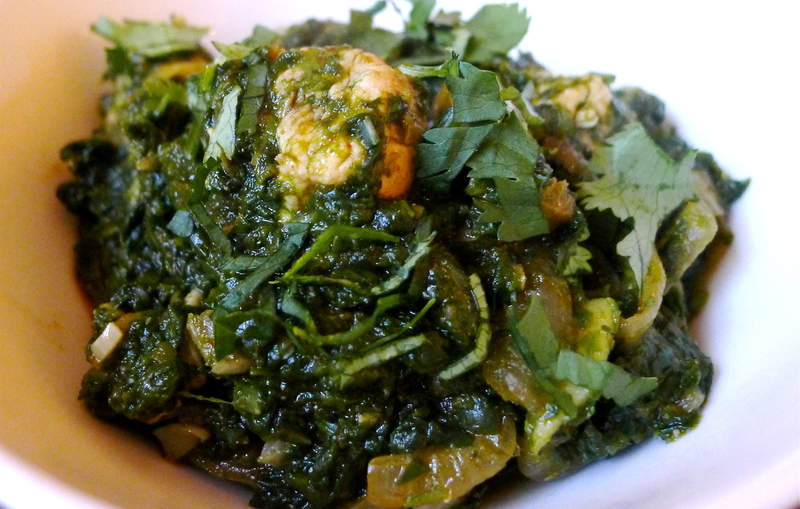 Im going to try and cook your recipe for Saag Chicken and i will let you know it turns out. I like the recipes youve got on this site and ill be attempting to try and cook some of them shortly.